Darren Ferguson is confident he has a hungry player on his hands after securing Cameron Stewart’s services for the rest of the season. The winger returned to Rovers to sign a loan deal until the end of the season. Stewart is out of contract in the summer at parent club Ipswich Town, who have made it clear he has no future at Portman Road. And Ferguson says Stewart knows he has to impress as he plays for his future. “I think it’s a good thing for us,” Ferguson told The Star. “He wants to continue his career as high up as possible so he will want to do as well as he can here to make sure of that, whether it’s with us or someone else. The 24-year-old made 17 appearances for Rovers, scoring three goals, before returning to Ipswich as his initial spell ended. Despite initially not knowing for certain whether he would be returning to the Keepmoat, Stewart rejected other offers in order to extend his stay with Rovers. Ferguson said: “He had other options but every time I spoke to him he was really keen to come back. 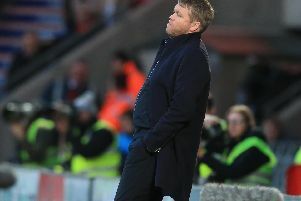 Stewart’s future in Doncaster always rested on whether Rovers could extend deals for Craig Alcock, Felipe Mattioni and Conor Grant. With Alcock and Grant secured, an injury to Mattioni paved the way for Stewart’s return. Ferguson said: “He understood the situation when he left. “We had Felipe here and he’s more of an attacking wing back. “Cameron understood I had a budget to work to and numbers also. “The decision with Cameron became an easy one because Felipe got injured. “In the formation we’re playing at the moment he can play up front, which he has done, but he’s done really well when he’s come on and played as a wing back, and we need that. Stewart suffered a back injury before the end of his loan deal and only returned to full training yesterday. But Ferguson insists he will be in the squad to face Gillingham on Saturday along with James Coppinger, who missed the FA Cup tie against Stoke with an ankle problem.